Claterbos lists a Leopold who was freed from his apprenticeship to Franz Seif in 1837, had a shop on the Graben in Vienna from 1852 to 58, and was made a Bürger in 1857. The first thing you need to do to appreciate this clocks impact is to find a clock that is 51 inches long without its heapiece. With its eight inch dial, and 7 inch bob, this is an imposing regulator. The case is in good to excellent condition with the typical minor finish scrapes. While the case is not the primary selling point for this timepiece, it is a very nice example of the Serpentine style - especially with the figural carving to the four corners of the door. Coupled with locking door, and general quality of the case, it makes a fitting statement for the exquisite mechanism it holds. And that really is what this clock is all about - the three-month duration mechanism. While relatively clean, and quietly ticking behind me on the wall as I type this description, the movement is dusty: I would recommend a cleaning before running it. 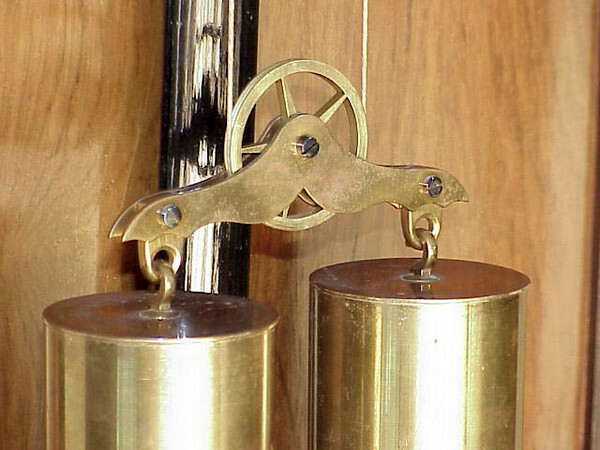 Naturally the mechanism has maintaining power, but, unlike a typical Vienna Regulator, the mechanism is a bit bigger, measuring 4.5 by 6 inches. And the plates are thicker than normal, measuring just under 3 mm. And, in keeping with a rather large piece, the wall stabilizers are amongst the most impressive I have seen on a wall clock - with heads that measure roughly 1.25 inches across. Note too the groove around the head and the locking nut with knurled rims to either side of the grooves. All lovely details one would expect to find on one of the nicer clocks available in the early 1850's. And, of course, there is the tandem weight arrangement. While I suspect the clock, if properly cleaned, would run easily on one of the weights, the tandem arrangement is quite attractive and adds to the overall visual and technical impact. Note too the lovely wood-handled winding key, the key-locking door (with appropriate key), the perfect condition and heavy brass-backed bob, the original beat scale (a little the worse for wear, but correct), the single-piece porcelain dial with nary a hairline, and, last but not least, the hands. The second hand is a work of art, in miniature - the perfect compliment for the minute and hour hands. As I have seen so very often, the better Vienna Regualtors don’t stop at just a quality mechanism - they reflect the quality in all of the pieces. While month-duration clocks are fairly common in the earlier periods, it is very unusual to find a three-month duration Serpentine. And, to find one a case in this nice of condition is an added treat! It is important to remember that, while I do not go into a great deal of detail about the mechanisms, long duration Viennese clocks have some of the finest mechanisms ever made. They have finer pivots, beautifully cast bridges (not the bent brass found in factory-made clocks): They really are a pleasure to work on, and have a such a quiet beat.